A High Quality, Low-Maintenance Portable Dust Collector with Built-in Compressor for CAD / CAM Milling of Dental Implants and Other Items with an Advanced Long-Lasting High-Volume Bag Filter and HEPA Filter for Quiet, 99.997% Removal of Dust and Particles as Small as 0.3 Microns--all at a Deep Discount Price with Free Shipping! Only 3 Left--Order Soon! Built-in Compressor--for powering other tools! BOFA’s DentalPRO Ride On Base dust extraction system effectively removes smaller particulates generated during the CAD/CAM milling of dental implants. The unit is designed for a CAD/CAM milling machine to be securely placed on top of the extraction system, which itself doubles up as a space saving stand. The unit’s high efficiency two stage filtration process allows technicians to work safe in the knowledge that dust particles are being effectively removed, to maintain a clean working environment. The bag filter has a large 18 litre capacity and the HEPA filter has an efficiency of 99.997% down to 0.3 microns. The high vacuum pump is brushless and designed for continuous running, which can run for in excess of 30,000 hours before requiring servicing. As a bonus, this model includes an onboard compressor providing the miller with clean oil-free air for all compressed air requirements, tools, etc, eliminating the need to have compressed air installed! 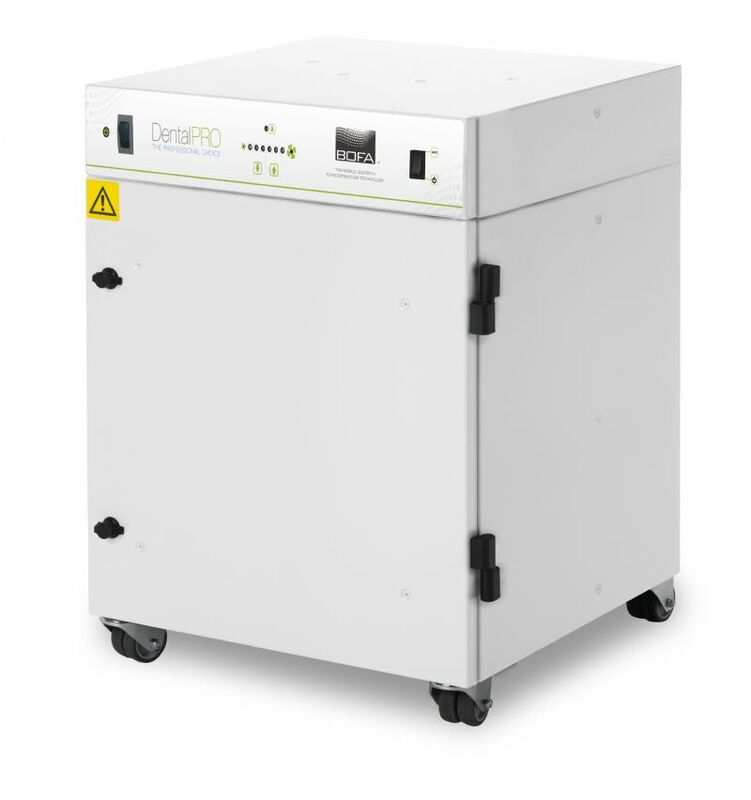 Order your DentalPRO Base Dust Collection System here at a discount online sales price and enjoy quiet, dust-free working conditions in your dental manufacturing facility or laboratory!